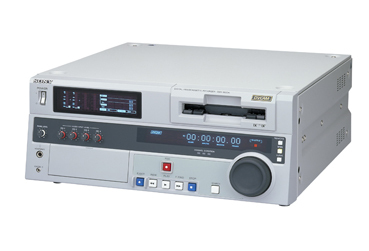 DVCAM Master Series Digital Videocassette Recorder w/i.LINK interface. The DSR-1800A has i.LINK interface as standard signal input/ouput. i.LINK interface includes audio unlock/lock function--when an unlocked audio signal in a DV recording (10 micron) is input via the i.LINK connector, or played back in a DV recording, this new A version Master Series VTR will automatically transform it to a locked audio signal which is defined as the standard of the DVCAM format to ensure frame-accurate editing. Two major features of the DSR-1800A is the built-in jog/search dial and its multiple format playback capability of DV (SP only) and DVCPRO 25. This unit has the ability to automatically accommodate all 25 Mbps cassette sizes, and does not require a cassette adapter or menu setting changes for playback of these formats. The DSR-1800A also has a full range of both analog and digital interfaces. The availability of the SDI interface ensures a migration path to Digital Betacam, Betacam SX and SDI-based systems. The SDTI (QSDI) interface enable a quality deterioration-free transfer between the DSR-1800A and DV compression-based systems. i.LINK interface as standard signal input/ouput.